Creating fabric from spider's silk - intriguing,isn't it? The technique goes back to about 300 years. 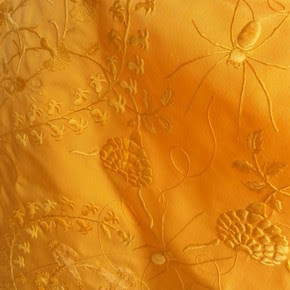 A special tool is used to collect silk from female Golden orb spiders and the fabric of bright yellow is woven from it. In case you're wondering if the spiders are killed during the process- no,they are returned to the wild after extracting silk. This cape is currently on display in Victoria and Albert Museum in London . Admission is free. In case you're somewhere around you could pay a visit. The artistry of the people of Madagascar deserves a salute . and thinking to me, spoke about this project. Crazy!! !tahns for the links!! (for the flowers, it's a surprise knowing my love of colors, but i like the achromatic flowers because it's original! !